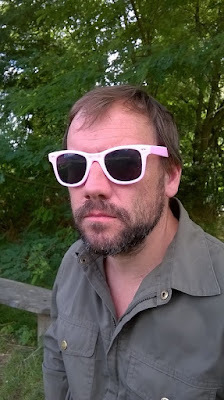 A big Happy Birthday to my gorgeous Mr Hippy - here he is looking deadpan in Little Hippy's Barbie Glasses. I hope you have a wonderful day Mr H! Unfortunately we won't get to spend the day together; he is away and I am working, so we had a little celebration last night. He's only been gone a few hours, I'm missing him already! Whilst you're here I'm happy to tell you that we have some great Stampin' Up! deals coming up in October that co-incide with World Card Making Day (October 1st) and beyond, so please make sure that you come back in a few days (at the very least) to see what's happening. That's it for today, I have a very shameful admission to make - I didn't get a chance to make a card for him (oooops), only a shop bought one, but I shall redeem myself on our anniversary. So no card picture today.